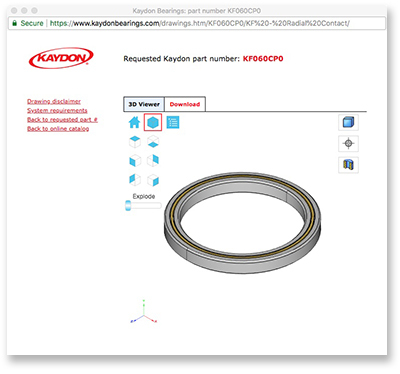 2D and 3D models of Kaydon thin section bearings are available to download in a variety of CAD software formats. Login or register to access drawings, product catalogs, and Reali-Design® software. To search Kaydon's thin section bearing catalog by bore size, outside diameter, width, and part number, use the thin section bearing selector. Kaydon's complete line of standard thin section bearings is listed below. Choose the appropriate bearing series by cross section dimension and type (angular, radial, four point). Select a part number from the resulting list to download the desired drawing.